I am taking it one day at a time. I trudge to work in the dim morning light and return in the dark. I cannot think too far ahead otherwise the amount of work that is yet to be done will overwhelm me. I wish there were more hours in the day, more days in the weekend. But I am happy. I am working towards my goal. A few weeks of intensity will (hopefully) reward me with a crisp, new diploma next year and a “Dr.” in front of my name. Please excuse the sparseness in my posts for the next few weeks. But let’s talk about this cake. This cake was born before all the work started. The inspiration: a deep purple bunch of coronation grapes that we got in our weekly fruit and veg delivery. I had never tasted a coronation grape before. I popped one into my mouth and experienced a tiny, intense burst of pure, crisp, sweet, grape flavour… and a thick, tough, skin. That’s what makes this sauce genius. You get all the grape flavour, while softening the tough skins. The cake is just a vessel for the sauce. 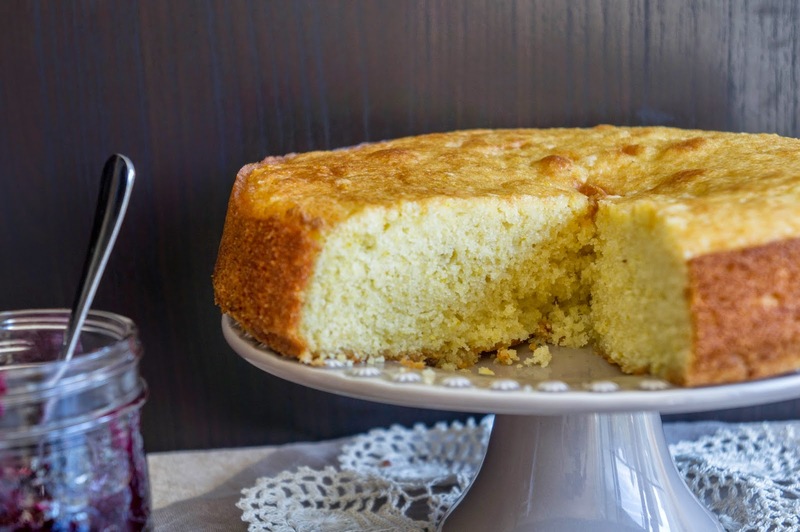 It’s not too sweet with a nice bite from the cornmeal. 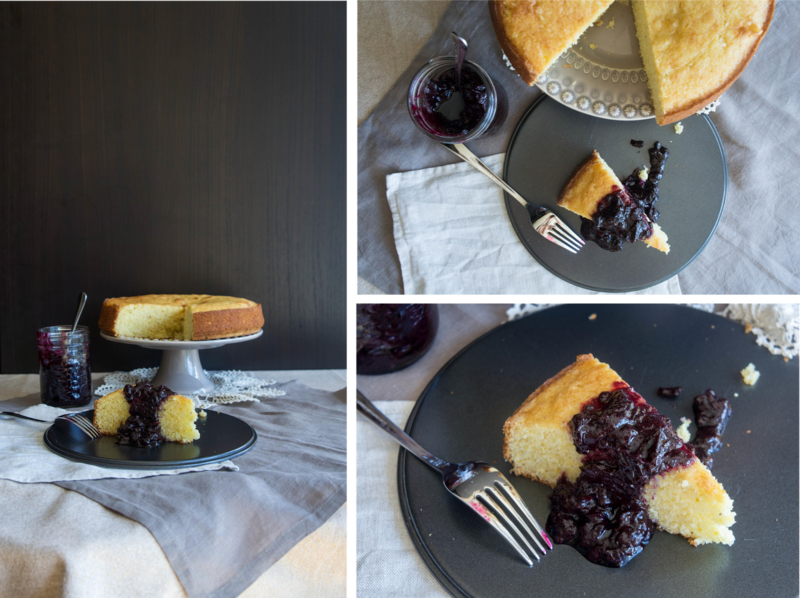 The citrus in the cake offsets the sweetness of the sauce. 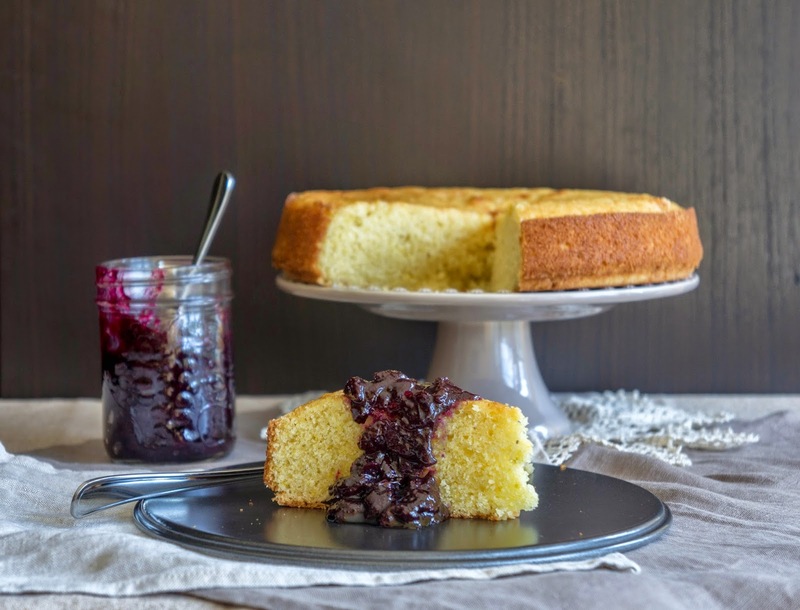 Spread the sauce on a thick slice of cake and eat with your hands, like a jelly sandwich. Or if you’re feeling fancier, add a dollop of whipped cream and eat with a fork. There are no rules. So let’s have a slice of cake and keep going. We can do it. Preheat oven to 350F. Grease a 10 inch springform pan and line the bottom with parchment paper. In a medium bowl whisk together flour, cornmeal, baking powder, baking soda, and salt. Set aside. In the bowl of your stand mixer or using an electric mixer, beat together butter and sugar. Add eggs one at a time, beating after each addition. Beat in vanilla, grated orange peel, and orange juice. Add a third of the flour mixture and stir until just combined. Add half the buttermilk and combine. Repeat with remaining flour mixture and buttermilk so that you end with the last third of the flour. Spread batter in prepared pan and bake in the center of the preheated oven for 35-40 minutes or until golden and top springs back if lightly pressed with a finger. Let cool in pan on a rack. 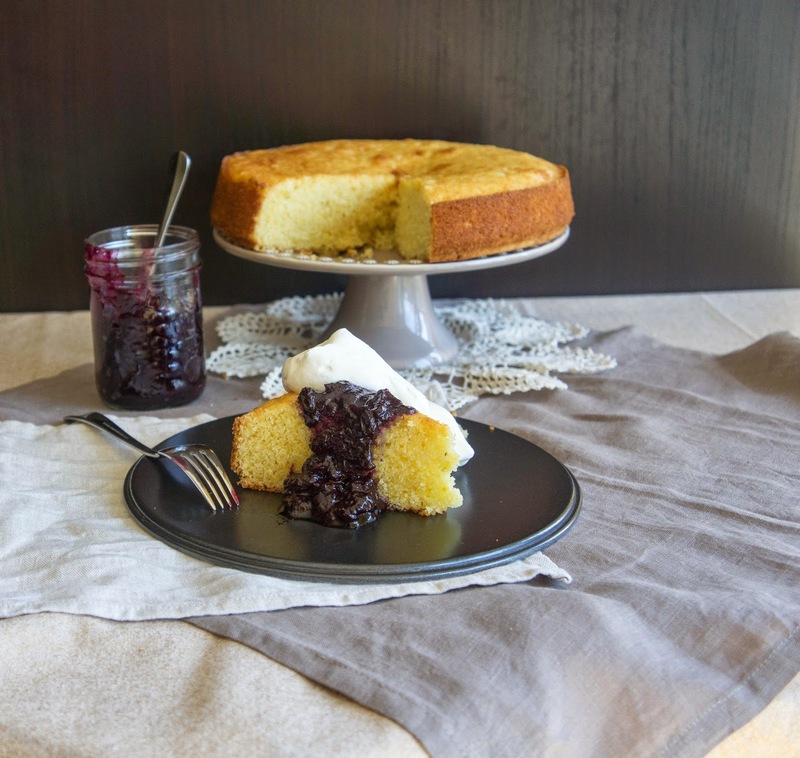 Serve large slices with coronation grape sauce (recipe below) and softly whipped cream. In a medium saucepan, bring sugar, honey, and water to a boil over medium heat, stirring just until sugar is dissolved. Let simmer over low heat until reduced by about half, 2-3 minutes. Add grapes. Bring back to a simmer and simmer for another 2-3 minutes or until grapes are softened and sauce is thick enough to coat the back of a spoon. Remove from heat and stir in vanilla and orange flower water, if using. 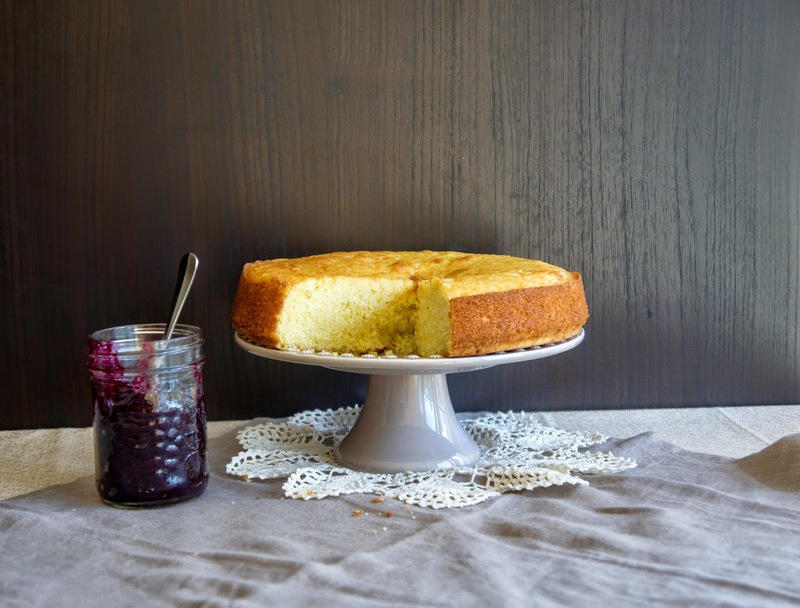 Serve spooned over orange cornmeal cake.